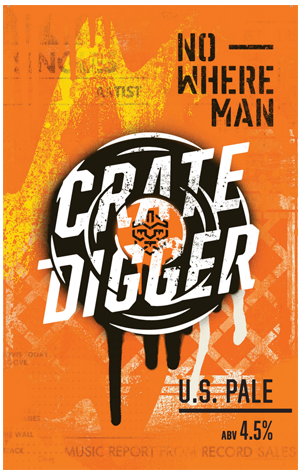 At the 2016 Light Up Leederville carnival, a very proud Nowhereman founder Reece Wheadon was able to showcase the first of his brewing company's beers: Crate Digger. Still a year away from having a brewpub open to the public, the American pale ale had been gypsy brewed with the help of the Perth brewing community. What was tasted that day and what currently pours from its West Leederville home is an aromatic beer with a balanced bitterness that belies its fairly weighty 50 IBUs [International Bitterness Units]. Citra, Simcoe and Amarillo hops deliver citrus and pine atop a Pale, Wheat and specialty Rye malt base. Named after the dusty fingered DJs of the old Leederville record shops, Crate Digger is equally anchored to the area's parties of the past and today’s brewpub celebrations.